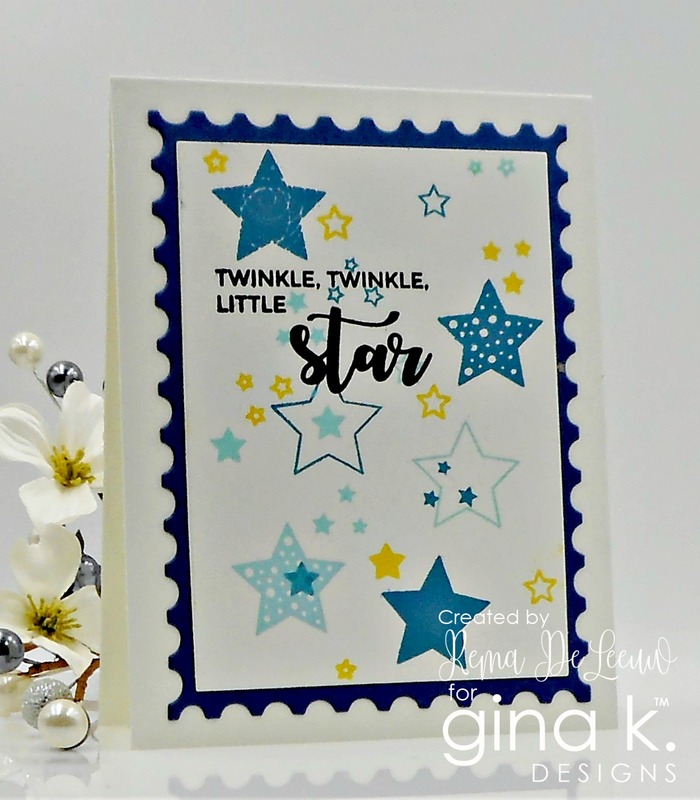 Welcome back to Day 2 of the Gina K. Designs January Release Blog Hop! Today we are showcasing two new sets illustrated by Beth Silaika and Emily Loggans. So let's get started. I have so much to show! 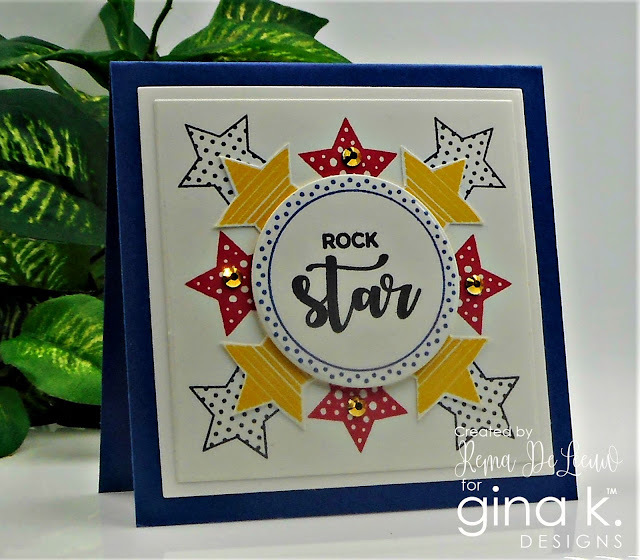 Here is the new set by Beth Silaika called All Star.This one is the perfect set to celebrate all the super stars in your life! You'll be able to create quick and simple backgrounds and a multitude of sentiment combinations. Inspiration created with this set. Next up we have Love Is All You Need illustrated beautifully by Emily Loggans and just in time to create Valentine's Day cards for all your loved ones. Also perfect for everyday cards throughout the year. Here are several cards featuring this set. Lovely Words. It will automatically be included with your order of $75 or more. 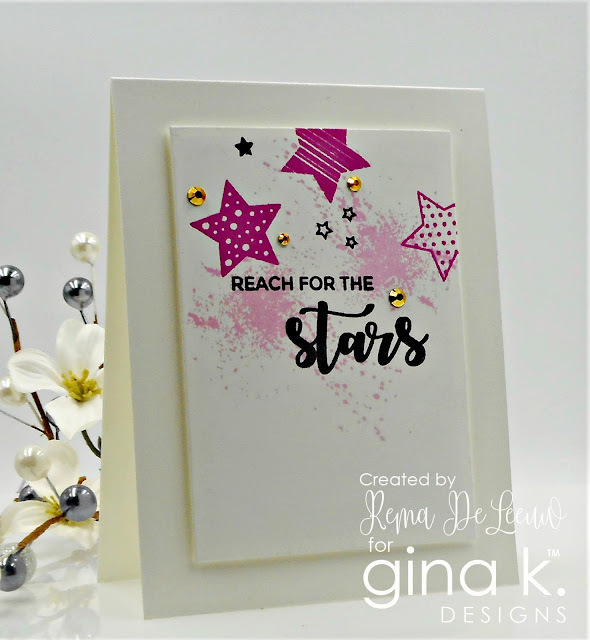 Click on the links bellows for more inspiration from Gina and the team. To celebrate this release two winners will be randomly chosen to win a $50 gift certificate to the on line store (one winner per day). Simply comment on all the blogs both days to be entered. Good luck! Well that wraps up the January blog hop. I hope you were inspired in some way. Thank you all for leaving such lovely comments. They are much appreciated! Isn't the wreath builder fun? I love the card with the stars using the wreath builder. Very lovely. TFS! All of your cards are amazing, love them all! Love all the new stamp sets. Great cards, so colourful and uplifting. Fantastic cards. I love all the stars. Thanks for the ideas using the wreath builder. Great cards! OH MY WORD! What wonderful ideas with the wreath builder...so addictive!! Lovely cards! I am liking the stars with all of the inspiration. Love the vibrant colors. Clean and simple! Thanks for all the inspiration! The wreath builder was unexpected! I like how you’ve used the All star with the wreath builder, such a good idea. Thanks for sharing. Great cards. Thanks for sharing your talents with us and inspiring us. Very colorful. Thanks for sharing! Great and different idea using envelopes and wreath builder! These cards are all so fantastic and wonderfully done. I am so enthused now to get my new sets. These cards are so colorful and fun! 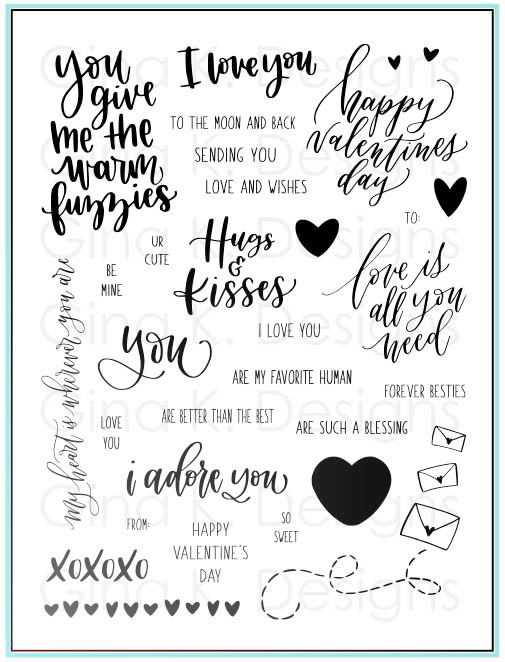 Love how you used the stamps with the wreath builder. Love your cards, Rema!! Thank you for showing us all sorts of different examples of what we can do with them. I love background on the first card! All very pretty cards. Great idea with the wreath builder. Wowza...Love all of your cards! Using the wreath builder was brilliant.Thanks for sharing. Great job with different ways to use the new release. 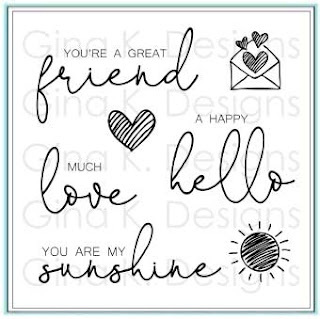 Thanks for sharing the new stamp sets. I love all your cards Rema! That last one is so adorable. The All Star set is perfect for grandmothers like me -- So many possibilities. Wonderful cards. wow! several well done cards! Makes me want to leave work and create some cards. Wonderful cards! The wreath cards with the stars and the envelope are so cute. Thanks! 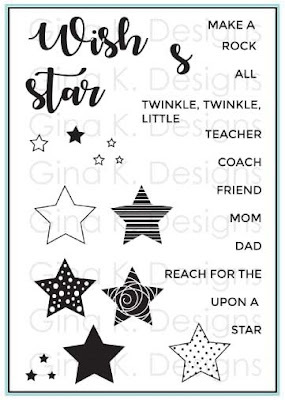 I love the "twinkle" card for a baby and the "rock star" for a younger person. Lots of bright and cheery colors as well. THESE ARE AMAZING!!!!!!!!!!!!!! I LOVE the star ones! Just so much fun and colorful! Just love all your bright, beautiful ideas!!! Thank you for sharing! Clever idea to make the wreath with the envelopes. Awesome cards! I love your ideas with the wreath builder designs! 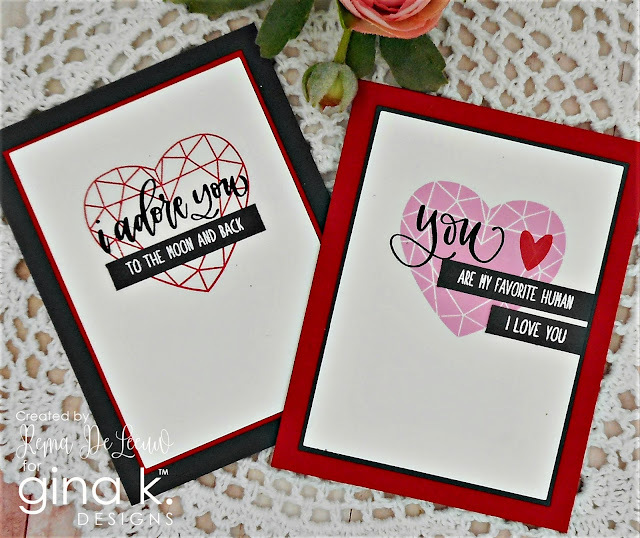 Fabulous card designs! Wonderfully happy and creative. Fabulous designs and ideas. Many thanks for sharing. Great cards with those great stamp sets! So many different great ideas for the same stamp set. Love your cards! Lots of great ideas! Thanks for sharing! loved your rock star and wreath letters!!!! awesome!!! Awesome cards, can't wait to get these sets!!! Bright and Beautiful cards. Look forward to these stamp sets. Rema, liked the Rock Star with the yellow and blue using wreath bldr. Also liked the hearts and envelopes, too. Love your wonderful cards. You are so creative. Great cards. I like that you use Gina's ink colors. The cards with the circle in the centers were a surprise design. My favorite card is using wreath builder set . Such a versatile set. Fantastic cards! Love your designs. All your cards are great, but I especially liked the "Rock Star" card. This would be perfect for my Nephew and will try to recreate. Nicely done all! Sweet and fun! Love your creativity with these new sets! Pretty choice of colors on all of the star and heart cards. Wow, it’s hard to pick a favorite from your cards! Your execution is beautiful and I love your cheerful color choices. Fabulous cards! 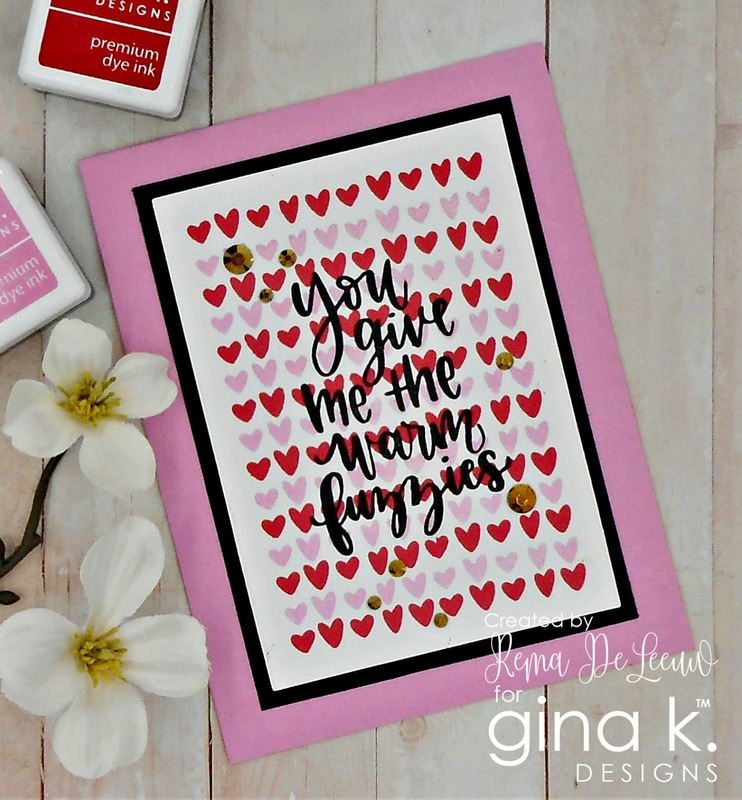 The much love card is a great design highlighting that sentiment! Great job, Rema! Your All Star cards are so fun and colorful, and your Love Is All You Need cards are so festive. You created beautiful wreaths, too. So many wonderful designs! 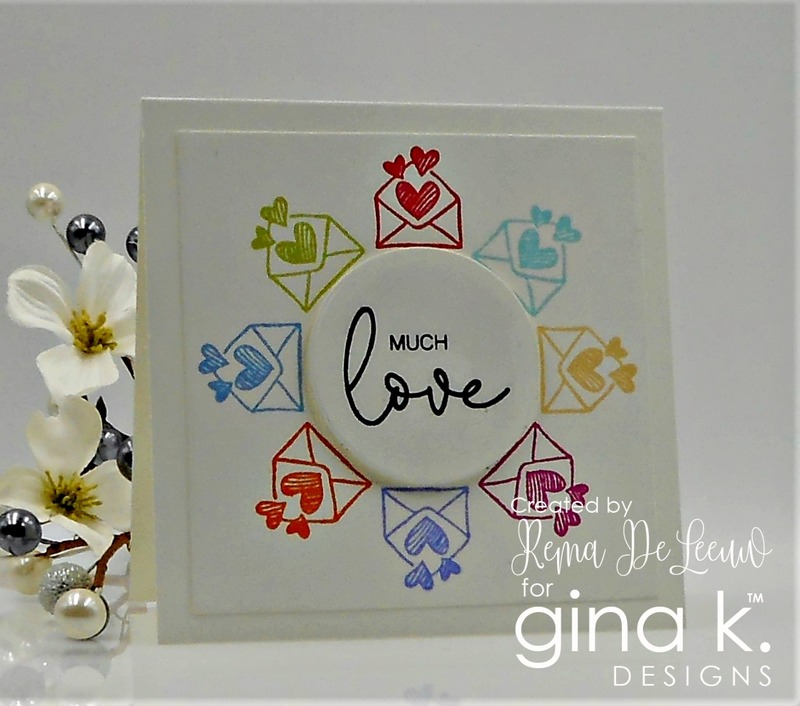 I adore the colorful envelope wreath you created - much love for that one for sure!!!! Thanks so much for sharing and inspiring! Beautiful! I love the ones you did with the wreath builder. I love how you lined up all of those hearts. They look amazing! Much love - swoon! Love that card. I love all of your cards, but twinkle, twinkle is just so sweet. I am so impressed with how many things you can do that incorporate the wreath builder. Wonderful inspiration, thank you! Cindy L.